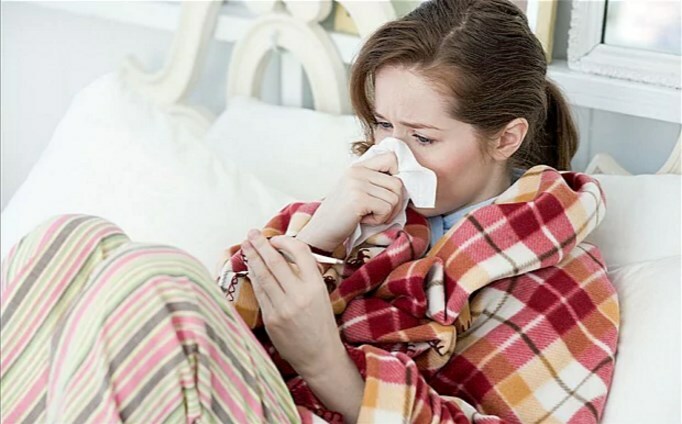 Flu and cold symptoms may both include a runny/blocked nose, sore throat, and cough. The flu is caused by influenza virus types A, B, and C. Both type A and type B flu viruses are responsible for the seasonal outbreaks of flu. Type A flu viruses are found in many different animals, including ducks, chickens, pigs, and horses. Influenza B viruses circulate widely only among humans. Flu viruses spread mainly from person to person, through coughing or sneezing by people infected with influenza. Sometimes people may become infected by touching a contaminated surface and then touching their mouth or nose. Healthy adults may be able to infect others beginning one day before symptoms develop and up to seven days after becoming sick. This means a person may be able to pass on the flu to someone else before ever knowing they are sick. There are two types of vaccinations, the flu shot and the nasal-spray flu vaccine. The flu shot is administered with a needle, usually in the arm - it is approved for anyone older than 6 months, including healthy people and those with chronic medical conditions. Treatment of Flu : As flu is caused by a virus, antibiotics cannot help, unless the flu has led to another illness caused by bacteria. Antivirals, such as oseltamivir (Tamiflu) and zanamivir (Relenza), may be prescribed in some circumstances. Painkillers may alleviate some of the symptoms, such as headache and body pains. Some painkillers, such as aspirin, should not be given to children under 12. There are some Treatment of Flue you can read with the help of given information..